Peter Singer is an intellectual founder of the Effective Altruism movement, which focuses on using evidence and reason to figure out the most effective solutions to the most pressing problems the world faces, and acting to support them. Developing solutions that work in complex situations is challenging in itself.To be endorsed by an effective altruism-focused foundation like Singer’s, an organization also needs to credibly demonstrate its impact and cost-effectiveness. 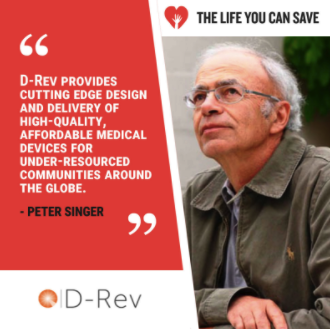 The support from The Life You Can Save (which takes its name from Singer’s book on effective altruism), matters because it is an important validation of D-Rev’s efforts to provide cost-effective solutions to closing the gaps in access to quality healthcare around the world. (Based on our impact audit from ImpactMatters, D-Rev’s cost to donors has averaged $26 per DALY averted.) It’s also likely to lift up and give higher visibility to D-Rev’s work among those who value the “effective altruism” thinking and approach who previously may not have been aware of our work. It also credits the care we’ve taken, and resources we’ve spent, to assess our impact. We are thrilled by this recognition, and grateful. It drives us to continue our efforts to always be improving and doing better by those who benefit from our devices, as well as doing better by our donors. It encourages us to believe that people care about transparency, shared learnings and well-documented impact. We also thank ImpactMatters since it was their impact audit that led to The Life You Can Save’s recommendation. Thanks to everyone who supports D-Rev’s work, and recognizes the worthwhile impact we are making. Peter Singer’s TED Talk, The Why and How of Effective Altruism The Life You Can Save was founded as an advocacy and educational outreach organization to raise awareness for the more than one billion men, women, and children who live in extreme poverty. Each year, The Life You Can Save announces their new list of “Best Charities” addressing global poverty. Each of their twenty recommended charities has a demonstrated record of effectively combating the causes and the symptoms of global poverty.